Appliance problems are a drag. We get it. No one has time for their appliances to breakdown. So that's where we come in. We provide sales & service. We will also remove your old appliances if they can't be given a Second Chance. Click here for Service, Appliance Removal, or Question. More than just appliance repair. Second Chance Appliance isn't just an appliance repair shop. We do what we do because we are committed to our community and to our environment. . When people can not afford brand new appliances, we strive our best to provide our customers with low cost, refurbished appliances. I have know Kevin and his wife for over 3 years now. I cannot count how many times in the last 3 years that Kevin has been there to help me. I will always make sure that he is my first call!!! Not only are they great people they are local business owners that really care about our community. Kevin Fudge is my go-to man for appliance repair and sales! He and his wife are friendly, helpful, kind and honest. He has come to our rescue NUMEROUS times in the past few months and he ALWAYS shows up with a smile! I HIGHLY recommend Kevin and Second Chance Appliance. Kevin and Sue are the definition of kind, friendly, and excellent customer service. We bought new appliances, and after the 1 year warranty was up, we started having issues. I have called them for my dishwasher leaking (fixed and no issues since), my old washer and dryer set that I didn't need after replacement, my ice-maker line stopped and leaking all over my freezer bottom, and most recently for my nonfunctional ice maker. They not only brought the right part, arrived promptly, were pleasant during the repair, were very reasonable in their pricing, but were just good people to be around. I would welcome them into my home at any time and recommend them to anyone who has an appliance issue, or who may be in the market for appliances. You will love working with them! Thank you Kevin for the quick and speedy service in fixing my washing machine today!! Great service and very reasonable. Definitely recommend you to anyone needing work done!!! My family is just moving into Republic Missouri from Milwaukee Wisconsin - unloaded the first truck this morning, and found out late this afternoon that we had a problem with our washing machine after the move. Called 2nd Chance at 5:30pm, explained the situation, and less than 2 hours after discovering the problem, it is already resolved. Mr. Fudge went above and beyond for us, and we are grateful for his awesome customer service attitude as well as his skills. When we need another repair, or when we need to buy an appliance, we WILL be giving Second Chance the First Look. I just bought a house and was a little low on cash but needed a washer and dryer bad! I told Kevin my price range and within hours he sent me pictures of what he had available in my budget and even delivered and hooked it up for us, without breaking the bank! And they work amazing! I am VERY satisfied with my purchase and Kevin's customer service! He definitely earned a loyal customer out of me! Amazing company, amazing family. They really know how to take great care of their customers. #1 in my book. I don't know how to say thanks enough. I really thought my washer was done & as a single mom I was stressing on how to afford to either fix it or buy another. But a friend recommended Kevin w/ second chance & he saved me. I will never forget the kindness & help. 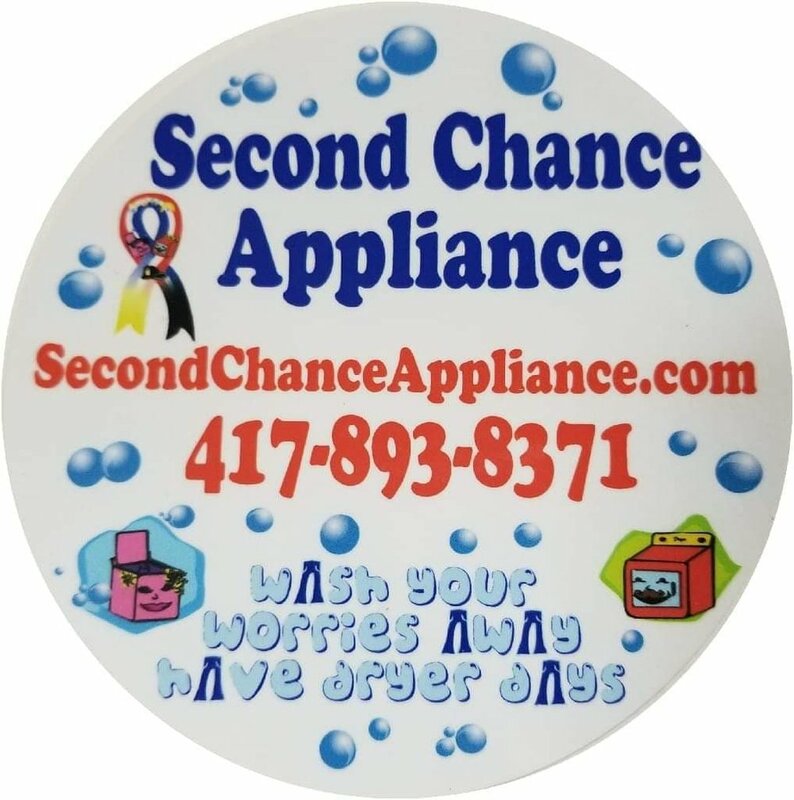 I will always keep second chance in mind for any appliance needs. This company comes highly recommended! They are honest people. And they have great customer service. I had never met Kevin Fudge-and when we bought our house-our appliances needed serviced-we were driving through town and seen the store. I gave him a call-he came the next day and I'm proud to say I now have a life long friend. It is so nice to have my dryer back! I messages Kevin on Facebook Saturday telling him I was having dryer problems, and within a few minutes I had a reply asking for my address. He actually beat me to my apartment! I was expecting to make an appointment for that coming week. He was amazing and had so much patience when he had to sit and wait 10 minutes for us. The service was MIND BLOWING! Thank you guys!! You were a Godsend for our daughter today. Thank you for blessing her with your expertise! 6 days after liking this page I had utilize the services of Second Chance Appliance...A "Leprechaun" showed up and fixed my dryer now I'm back to "blown hot air again!" Great service, friendly staff, HIGHLY recommend!!! Found Facebook!! Only for you :) You guys are THE BEST! Cannot thank you enough for always - day, night or weekend - being available to save the day! Washer/Dryer are still up and running all because of you. So thankful to have good, honest people to service our appliances! My dryer was making the worst noise, I called Second Chance Appliance, they were here in a jiffy and left my dryer purring like a kitten instead of roaring like a lion! Honesty in doing whats needed, not trying to rob you and good, professional work...Thank you!!!! I am so thankful I heard of Second Chance Appliance! Not only did Kevin answer my call after 6pm in an effort to help my parents with their refridgerator issues, he came the next day, texted updates and pictures and showed integrity and care for my parents and their fridge was fixed for half the money it would cost another company for the service fee alone!!! Use Kevin, I have no doubt in my mind that he will give 100% in what he does or what he tells you. He is honest, hardworking, communicative and local! Use Second Chance! Absolutely the best service! On time, quick and very very good rates! Kevin was very efficient and friendly! I have known Kevin for years and am very impressed with his personalized customer service. Have general questions? No problem. Give us a call at the number below, or use the form to the right to let us know how we can help!